Like millions of kids, I grew up with animated movies and TV shows playing constantly at home. I loved the timeless and never-ending classics courtesy of Disney, the anarchic Nineties Nickelodeon, and the odds n’ ends provided by countless other amazing studios. Even as I’ve grown up, completed grad school, and started life in the “real world,” my fascination with cartoons and animated media hasn’t waned. It’s still my go-to for entertainment comfort food and I always look forward to the latest releases. But, as luck would have, I don’t have an artistic bone in my body (at least when it comes to drawing). So, in some ways, my love of animation has always been a love kept at a distance from someone who simply admires the form and will forever be amazed by the process and hard work required to turn drawings into emotional representations of thought and feeling. And it’s because of my distance from the actual manner in which cartoons that I was so intrigued by the directly apt-named book I MOVED TO LOS ANGELES TO WORK IN ANIMATION (Boom Box! ), the hilarious and poignant new comic by storyboard artist and creator Natalie Nourigat. 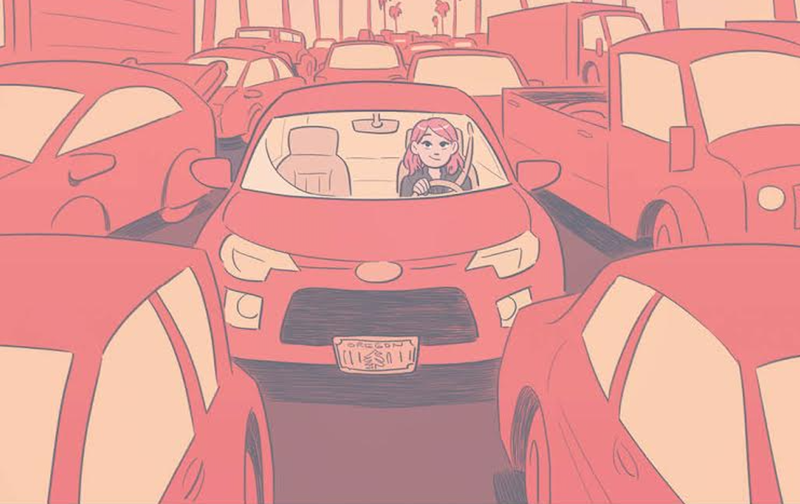 Over the course of the book, Nourigat details her sojourn from her native Portland, OR, down to Southern California to find a gig in studio animation. Part memoir, part travelogue, and all lushly drawn I MOVED TO LOS ANGELES is simply a wonderful book for those who want to learn the finer details of the animation industry or who just want to read a charming, witty ode to those who dedicate their lives to bring happiness to others. Recently, I had the opportunity to interview Natalie on the release of her book, including what inspired her to pursue a career in comics and animation, the most important tips she’s learned along the way, and how the animation community reacted to her inside baseball memoir. “I MOVED TO LOS ANGELES TO WORK IN ANIMATION” cover. Couresty of Boom. Art by Natalie Nourigat. AJ FROST: Hi Natalie! Thank you for taking the time to chat today. As an animation nerd since childhood, I really enjoyed learning about your trials and tribulations as you found your footing in the industry. It was a relatable journey, for sure. Do you remember what the specific impetus was to take all of your experiences and channel it into this book? Did it happen during a moment between projects, or was it more of an organic outburst of creativity? NATALIE NOURIGAT: Thanks, AJ! Well, I always keep a journal, and since I had a hard time moving to LA and starting a new life for myself down here, the journal started turning into a kind of therapy for me during my first years in LA. I really missed having close friends and family I could unload stuff on. I didn’t have anybody in LA I could talk honestly with for the first year or two, and when I called people back home, I wanted to just talk about the positive so they wouldn’t worry about me and they’d still want to pick up the phone when they saw me calling. So to get the truth out, I wrote down in the journal things that were going well, things that were going poorly, and what I wished would happen next. I think I was subconsciously planning to turn it all into an autobiographical comic from pretty early on, but it morphed gradually from a totally self-indulgent comic to more of a how-to comic. FROST: What are your earliest memories of watching something animated (could be a movie or TV show) and thinking that this was a field that you wanted to work towards in life? NATALIE NOURIGAT: Even as a kid I wanted to make cartoons, but I didn’t know anything about how it worked, or that it was a career option. When I was thirteen, a friend showed me Princess Mononoke, and it was like a flip switched in my brain. It was so cool! I wanted to make things like that! I already drew a lot, but I started mimicking the Studio Ghibli style and getting a lot more into writing my own stories. I started making my own comics. When I was 16, my family went to see The Incredibles on Thanksgiving. It was such a good movie, and when I saw all of the names after the movie I realized that it was a job I could conceivably pursue right here in the US. I remember looking at the full moon out the window of my mom’s minivan on the drive home and SWEARING on the moon that I would work for Pixar someday! Courtesy of Boom. Art by Natalie Nourigat. FROST: Would it be fair to say, judging from your comments in the book, that comics are your first love? How has this creative medium contrasted with your day job? Or do you see them as opposite sides of the same coin? NATALIE NOURIGAT: I do love both comics and storyboarding for animation. They’re different art forms, they have different limitations and abilities, but they are both mediums for visual storytelling. With comics, I have a lot more control. I’m normally drawing for me, and maybe there is an editor, but I get to decide what the story is and how the art will look and whether or not I take outside notes. In animation, I work in a big team, and it’s a huge group effort. Since storyboards are “temporary,” I can say, “Ehh, this perspective isn’t right, but you get the idea.” It’s nice to be able to operate at a story level like that and not agonize overdrawing details. I play a specific role within a big production, serving a director’s vision, but I get to work with other people and make something with a much bigger audience. I also get to learn from the people I work with, and I love that. I feel like I’ve gotten a lot better at drawing and thinking about story just by talking to and observing the people around me at work. I keep trying to make comics in my free time even while I have this job storyboarding for animation, because I really do love having both in my life. They’re each like a vacation from the other one. FROST: You bring up the point that the animation community is insular. How has the reaction been to your book been from within the industry? NATALIE NOURIGAT: More positive than I even hoped! A ton of people have reacted like, “Why wasn’t anyone making a book like this sooner?” Like it was a really obvious hole in the market. I got so many emails and messages from people in the same place I was a few years ago telling me, “Thank you, I thought I was the only one feeling this way.” Several people told me that they had given up on working in animation, but they read the comic and then decided to keep trying, and now they work in the industry. I mean, bwuh, that’s the kind of impact you dream about having when you make a comic. It was incredibly validating. I will say I’m really glad I had a diverse group of people proof-read the first and second drafts of the book. They gave me some really good feedback and I think the book is much stronger now than it would have been without a harsh round of notes early on. For example, I work primarily on feature films. My friends who work primarily in TV saw some of the things I was saying about working conditions in animation and they were like, ‘I think you have a blind spot here. Your experience isn’t typical; most people have really different working conditions. Let me tell you what’s more normal in TV.’ They could also tell me honestly when I was being self-indulgent or skipped over important stuff that needed to be spelled out more thoroughly. The book doubled in length between the first and second drafts. Those proofreader friends really kept the story on track. I was surprised that a few readers have asked for more content. They want more chapters that would address breaking into the US industry from other countries, or about what happens after your first job, progressing in the industry, etc. I really hope a bunch of people read this book and get inspired to share their own journeys. I think everybody’s story would be different, and it would help all of us artists to hear many different perspectives. FROST: While I’m not saying there’s a connection (because you’re no curmudgeon), the directness with which you connect to your reader reminded me of Harvey Pekar a bit. Not in the tone, but in the style. As you were writing about your journey, what autobio books did you look to for inspiration? Were there any in particular that you turned to? NATALIE NOURIGAT: Autobio is probably my favorite genre of comics. I definitely adore and look up to Erika Moen and Boulet. Sam Spina made a really helpful autobio comic about how he came to work on Regular Show a few years back; that was a big inspiration. Anthony Holden also made an autobio comic for Tumblr about gaining life experience before working in a studio; I wanted to make something like that to help people, too. Aude Picault is one of my favorite cartoonists. Marbles by Ellen Forney opened my mind to new possibilities for the kinds of things I could talk about honestly in my comics. Maus, Blankets, Persepolis, Emitown, Hyperbole and a Half, Smile, How to Understand Israel in 60 Days or Less, and French Milk are all favorites. FROST: What skills cultivated by creating your own personal comics translated neatly into the animation field? And what was the most significant reorientation of your creative process as you made your way into the industry? NATALIE NOURIGAT: Luckily, a lot of skills transfer between comics and storyboarding. Drawing skills, anatomy, clarity, composition, visual storytelling, developing specific characters, writing your own content, coming up with visual gags, mastering specific facial expressions and acting, conveying emotion through shot choices, etc. The things that were hardest for me, going from comics to storyboarding, were learning how a film camera works (needing motivation for cuts, telling a story with shot sequences and where you put the camera, maintaining camera direction), and drawing more loosely. Storyboard art can be loose and gestural; you can leave in construction lines. It felt really wrong to turn in art like that; I felt lazy for not “inking” and “coloring” everything, but my Heads of Story finally convinced me that it was better to keep things loose. It makes me draw faster and think more about the IDEAS than focusing on little details that don’t really matter in the grand scheme of things. It also makes it easier for the director to say, “Actually, instead of inside the house, could we set this whole scene in a forest?” We need to be able to turn on a dime and change our scenes, so drawing fast and keeping it loose is good. FROST: You mention throughout the book that your journey into the animation industry isn’t a typical one. What do you say to those who would like to follow in your footsteps if this path truly is their calling? 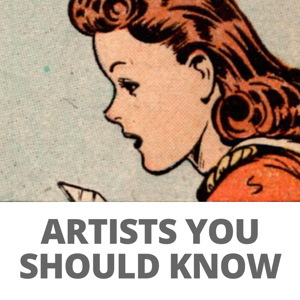 NATALIE NOURIGAT: Take as many drawing classes as you can, especially figure drawing. Watch movies and study film. That can be formal classes or informal movie nights with friends. (Also, dive into theater, comics, novels, painting, whatever floats your boat and gets you excited about art and story.) Discuss with other people what you saw and what you thought worked and didn’t work. What changes would you have made to improve the story? Learn to debate in a constructive way; it’s great to have strong opinions, but animation is a group project, so we need to always be respectful, LISTEN to what each other says, and be open to changing our minds. I definitely recommend making comics; it’s a great way to develop your storytelling and drawing skills. Make your own stories. 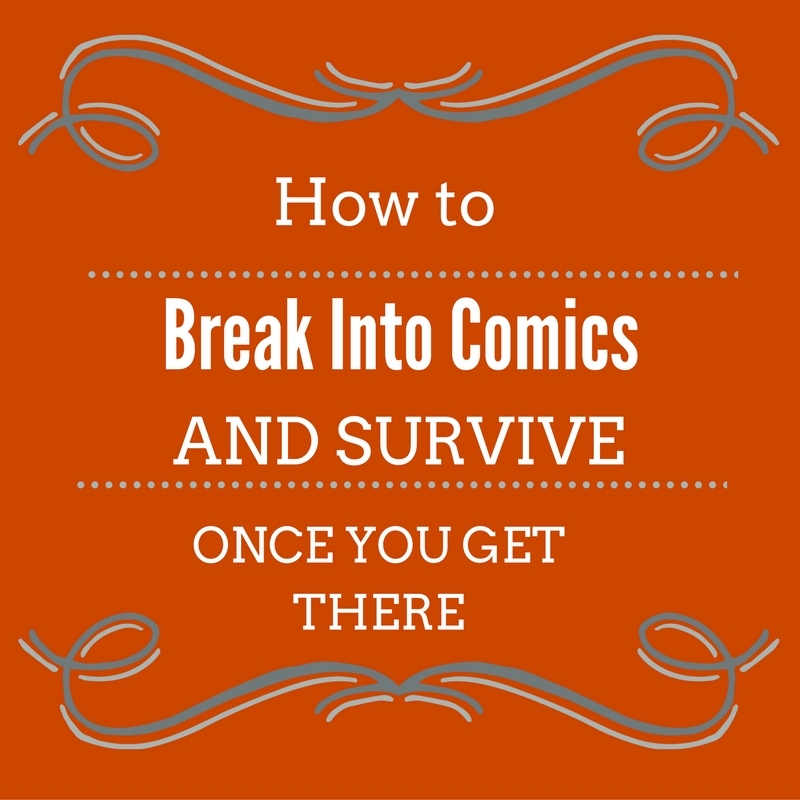 Start with autobio if you don’t want to write stories from scratch right away. Put your work online, and post it to Instagram, Twitter, Tumblr, and Facebook art accounts so you can build a following and get on recruiters’ radars. Apply to studios early and often – check out their websites and look for their “career” pages, and bookmark websites that aggregate job listings from studios. Don’t be shy about applying; the worst thing that happens is they say “no”. If you apply many times to the same studio, and you apply with new work every time, the recruiters will start to recognize you and see that you are serious, that you are actively working and improving. It’s a good thing to apply to the same places over and over even if they say “no.” Get out and meet other artists in person if at all possible. The internet is great, but a sketch group or ASIFA meetup or comic convention can introduce you to things you didn’t even know existed and speed up your development. Visit LA if you can. Come to industry events if you can, like CTNx, Annecy, etc. Meet people, try to make genuine friends over time. Nobody is your direct competition; think of other artists as your coworkers, because they probably will be at some point. This is a really social industry. I mean, a lot of us are introverts, and a lot of us have social anxiety, but I mean that we’re making art in big teams, with the intention of making art with mass appeal, so we have to be interested in people to make good characters and stories. Develop a real interest in other people; look out for the people around you, think about what they are doing, why, and how they might feel. Keep your eyes peeled in your everyday life; look for details about the people around you that reveal character. Everyone is a unique combination of traits; the way that people talk, dress, walk, and treat each other is all really important in a story. Keep a sketchbook on you at all times and draw real people you see in cafes / on the bus / at the beach / in the mall as much as you can to learn to pick up on these things and file them away as a big library of options for your fictional characters. Keep the joy of drawing alive; keep making things just because you want to do them or you’re curious about them. That will serve you really well and help you not burn out. It can take a long time to break in and a lot of it is just dumb luck, so don’t be too hard on yourself if you see other people breaking in sooner than you. Hang in there! FROST: My last question for you: What’s next for you? You’re probably already working on your next feature, but do you have any personal projects in the pipeline? NATALIE NOURIGAT: Ahhhh I can’t talk about it! Ask me next year! FROST: Thank you so much for chatting! I MOVED TO LOS ANGELES TO WORK IN ANIMATION arrives in local comic-book shops on December 26, and will be in bookstores on January 1. Cool interview. I recognise a lot of what Natalie says about approaches, and it’s just great to read it.